If you’re planning to go to Gasparilla we have the best ways to get down there safely. 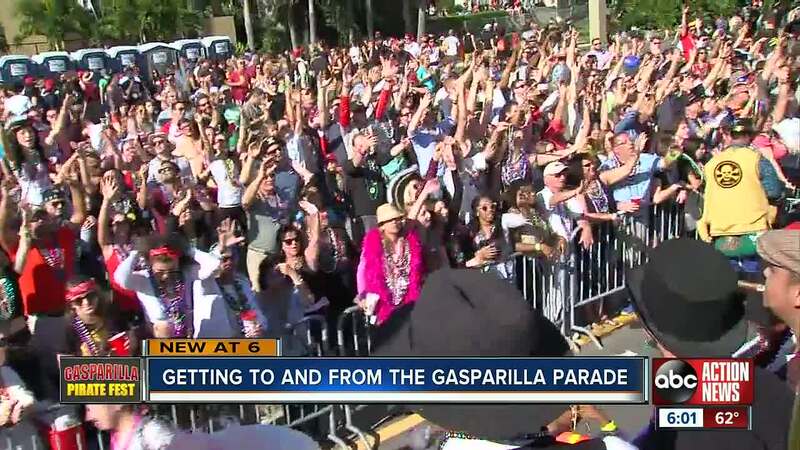 TAMPA, Fla. — With more than 300,000 of people heading to downtown Tampa this weekend for Gasparilla, getting down there and finding a place to park can be tricky. But if you don’t want to worry about driving and parking there are other options. Lyft will have two tent areas, one along Bayshore and the other in downtown Tampa on Twigg and Ashley to help assist with rides. We rode along with Lyft driver Luis Gutierrez who says to stay safe, get a ride. And he gave this advice on the side. "If you’re going to start drinking please have something in your stomach otherwise it's going to be a long day," said Gutierrez. Uber says they can pick people up and drop them off three to four blocks from the parade route. "I can tell you a little secret, a lot of people park in Ybor and then ride a free trolley in from Ybor," said Stefany. HART will be offering extra streetcar, bus and trolley services as well. Organizers say one thing is for sure, regardless of how you get down here wear comfortable shoes and expect to walk more than you usually would.